Wine bottle | Sew Giddy!! I bought a bottle of wine as a gift for one of my best friends, and although it was her favorite wine, I felt it was just a too impersonal to simply hand over a bottle of wine. SEW….I decided to dress it up a bit with a personal touch! 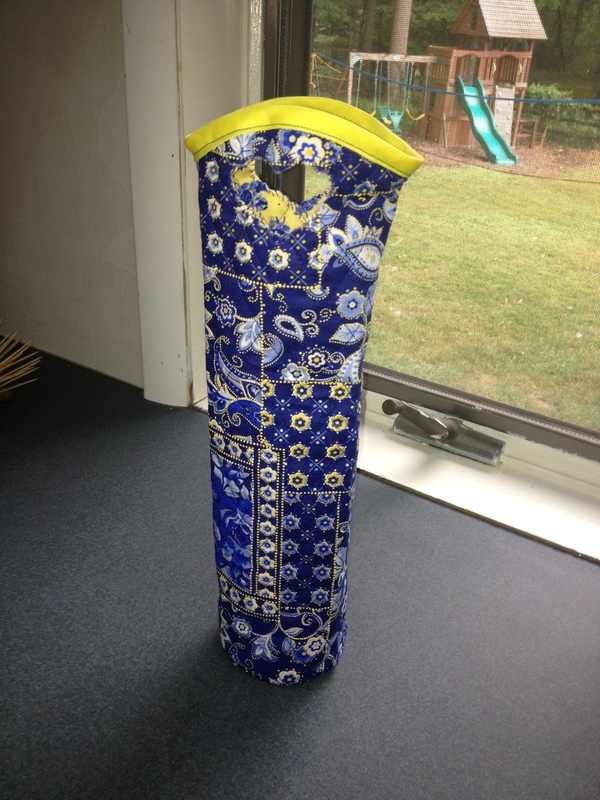 Using two pieces of double-faced quilted fabric for the sides (that measure tall enough to hide the bottle inside) and a round piece of the same quilted fabric for the bottom (that’s larger than the base of the bottle and allowing for seam allowance), I whipped this wine bottle bag together, finishing it off with scrap bias tape to cover the top of the handle. Bias tape the seams on the inside and it’s reversible! I cut a heart out for the handle and hand-sewed around the heart’s edge to give it that homemade touch. I filled this pretty bag with the bottle of wine surrounded by delicious chocolates and even added a gift card to a restaurant my friend is known to frequent! I love the way it turned out! Since the inside has coordinating fabric, it is pretty to look inside of it as well! I love how this bag is not only cute, but reusable too! Sew…what have YOU created to give that ordinary gift a personal touch of love?